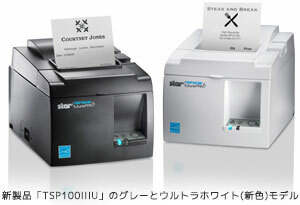 Star Micronics releases TSP100IIIU, a newest USB model of the series, to add a new line to TSP100 series which is a 3 inch thermal printer for mPOS (*1) market. This newest model joined the TSP100 series which has exceeded the accumulated sales units of 1.4 million and realizes, with USB-wired connection, the stable communication required to the mPOS market in expanding demand. Especially the iOS devices will be able to communicate and be charged at the same time through the Lightning cables. TSP100IIIU is proud of further more stylish appearance and high functionality in comparison with the conventional models and is also designed to be compatible with such printers. It can print very quickly even the graphic data at a maximum printing speed of 250mm/s and is equipped with de-curl function to keep the printed receipt paper from curling. It is equipped the USB-TypeA and USB-TypeB ports and when connecting the former to iOS devices and the latter to Windows and Android devices, it offers a new solution to those users concerning the connection issues with wireless communication such as with tablet devices. With USB-TypeA, it can charge simultaneously the devices at maximum 2.4A when connected to iOS devices by Lightning cables. In order to have more affinity with iOS and Android devices than the conventional printers, the special store application (*2) and online manual will be provided for easy setup and setting changes. Starting from Japan, we will expand its sale worldwide, including US, Europe and Asia and will target 270 thousands units of sale by the end of fiscal year 2019. We have been proud of high market share in mPOS printer but will try harder with the introduction of this new model. (*1) mPOS（mobile Point of Sale）. Normally tablets are used in this POS system. Compared to conventional POS system and to those with PC, initial cost for introduction can be lowered. (*2) Special applications for iOS and Android which are downloadable from App Store or Google Play. » Compatible with the conventional TSP100USB models, highly functional and with further more affinity and convenience with mPOS. » The first receipt printer which has realized the Lightning connection which can communicate with USB on iOS devices such as iPhone and iPad and can charge them at maximum 2.4A. A solution resolving the concerns with wireless communication which sometimes is unstable. » 250mm/s is the fastest printing speed in the futurePRNT series thermal printers, which is realized even for graphic data printing. » New stylish ultra white color and cool blue-based logo design including the LED. » The package includes printer, sample thermal roll paper, power cable, USB cable and wall-mount kit. » De-curl function (keeps roll paper from curling). » Thin paper supported (minimum 53 um). » Diagnostic mode to detect communication status. » Easy setup guide and link to manual by QR code are provided for any mPOS users to set up communication with mobile devices in shorter time. » HTML manual provides the latest documents any time. -iPad and iPhone are trademarks of Apple Inc., registered in the U.S. and other countries.